from the start, there was one condition to the then-fifth-grader’s willingness to up and plant himself anew in the cobbled city by the river charles: “i’m not going without turkey baby. either turkey baby comes or i don’t. period, the end,” the adamant one declared. yes, on that pre-cambridgian day when cat allegiance was proclaimed and etched in promise, so ended any scattered thoughts of whom we might appoint custodian of cat whilst we ditched east to 02139. no foster dwellings for Le Fat Cat. he was stickin’ with his People. alas, unbeknownst to the four-pawed fellow, he was — for 11 months — leaving behind his leafy life along lake michigan, trading it for what would amount to third-floor incarceration, with nary a skittering critter to pounce, and no patch of grass in which to writhe ecstatic. wasting little time, we began to explore the myriad modes of transport. or rather, I — being the sole coordinator of these nitty grits of daily life — began exploring how to shlep fat cat 1,000 miles from where he’d long and blissfully roamed. transport, mind you, is a daunting thing for a cat who’d not do well with sitting tight (say, confined to the airline regulation 18-by-11-inch satchel), a cat who had not spent a single day of his existence bound beneath a roof. our fat ol’ cat, you see, was the original ramblin’ man. from farm fields he did come, and unto farm fields he would forever roam (admittedly, our cat has vivid imagination and must have imagined hydrangea bush to be his rows of corn, prickly rambling rose to be his blackberry brambles, etcetera, etcetera…i wonder if he imagined me his scarecrow?). didn’t take more than a minute to rule out packing ol’ TB in the back of the little black sedan for two days, interrupted — somewhere deep in pennsylvania — for one mere night’s respite, with unbound motel acreage. suffice it to say, as i’ve said here before, that the short flight from chicago to boston was a messy one, one that i sported billboard-like across my chest as i de-boarded said plane. and let me add that it’ll be a cold day in hades before i ever again skitter onto a plane with scaredy cat in tow (snazzy black cat sack or not). for all the troubles getting here, though, there’ve been umpteen-million times when that ol’ cat did just what the doctor ordered: in his own furry way, he made the young boy feel like his whole world had not turned tipsy topsy. that fine old cat curls on the boy’s bottom bunk by the hour. snuggles beside the kid as they both soak up the $159-a-month cable-sports package. rubs his little head against our shins when it’s vittles time again, and always seems to thank us when we oblige. but, slowly, and incessantly, signs of trouble cropped up here and there. most often in the deep dark of night, with a howl to wake the block. i’ve come to know the guttural bellow as the uh-oh-move-now-or-else-you’ll-spend-the-wee-hours-scrubbing-the-landlord’s-rug meow. i’ll spare you details other than to mention that, these days, we could probably count the poor guy’s ribs, and any minute now we’re heading to a vet on the far side of the city, just to figure out what lurks within. “will he make it home?” he wanted to know. i can’t quite figure out how we’d do it any other way. i could not leave that cat, not in any form, here where we won’t be for too much longer. i can only imagine him forever residing in our garden. even if that means, yes, a few feet down. i’m sure most minds wouldn’t leap to the task of trying to figure out such things, but i’ve been strapped with the sort of brain that never sits still in the moment, and always leaps round the bend and four mountain climbs ahead. and so i think too many things, untangle knots before they’re noosed. we’ll see what light the vet can shed. and believe me, it’s a might load of worry that gets me to dial up a slew of strangers, searching for a D.V.M. with appointment slot and inclination to take on a sad new case. for the first time since that messy flight back in august, i will stuff mr. TB cat back into snazzy bag, head out into the howling winds (for spring has temporarily ditched these parts and we’re back to winter once again), and await the diagnosis. could just be old age, in which case i’ll hedge my bets and wager that i’ll get the old cat back to the haunting ground he knows and surely searches for in his purr-stoked dreams. or else it’ll be something more nettlesome, and hard to cure. these are the sad truths of making room in your traveling troupe for furry, purring heartmates. we would not leave home without our trusty cat, and by hook or by crook, we’ll not go back without him. there is only one true answer to my sweet boy’s question: you betcha, he’ll make it home. has there been a long loved furry (or hard-shelled) friend you count among your dearest inner circle? has he or she or it (for hermaphrodite worms might be your choice in pet) stuck with you for the long haul, and could you imagine your days without the fine one’s ways? Oh, bam, how many times have I sat at my work computer sniffling and dabbing, hoping not to be detected, as I read your dispatches and meanderings. Lost count. I have had the honor of going through life with Abigail since I was on the cusp of 13. By my intuition then, and a more informed guestimate now, she was about 40. That was in 1964. Abigail, of course, is a turtle, a three-toed box turtle and my first-ever box turtle. She’s petite for her species and outgoing, making her the darling of the animal hospital we go to. The growth rings on her high-domed shell were weathered shiny smooth when I got her. Because box turtle shells weather in the wild at a loosely calculable rate, I have a loose idea of her age. She survived the tail end of grade school, high school, college and all the other messy times of my life. She has a healthy appetite most of the time. On mornings when she wants a drink of water, she teeters on the edge of her shallow Pyrex pie plate pond and somehow reminds me of a silent-era bathing beauty about to dive in. She’s had a couple of heart-stopping (mine, not hers) injuries, but she’s in pretty good health. One of the joys of turtles is the potential for them to be around a long, long time. The great sorrow is when such a fixture in your life dies. You are anticipating this now, and my heart goes out to you. But you will make all the right decisions, and one way or another, TB will come home with you. exhibit A: do we not have saints among us here? you gotta love love love a soul who loves her turtle, her three-toed turtle no less, for her whole life long. decades and decades. and, still after all these years, she sees her as a “silent-era bathing beauty about to dive in.” be still my heart. you melt me. friends, i mostly met karen making her rounds early every saturday morning at the evanston farmer’s market where she drapes her arms with bags and bags of the freshest organic greens, for all her hard-shelled friends at home, who appreciate a fine chopped salad. what’s not to love, not to be charmed by? hullo beautiful mar! 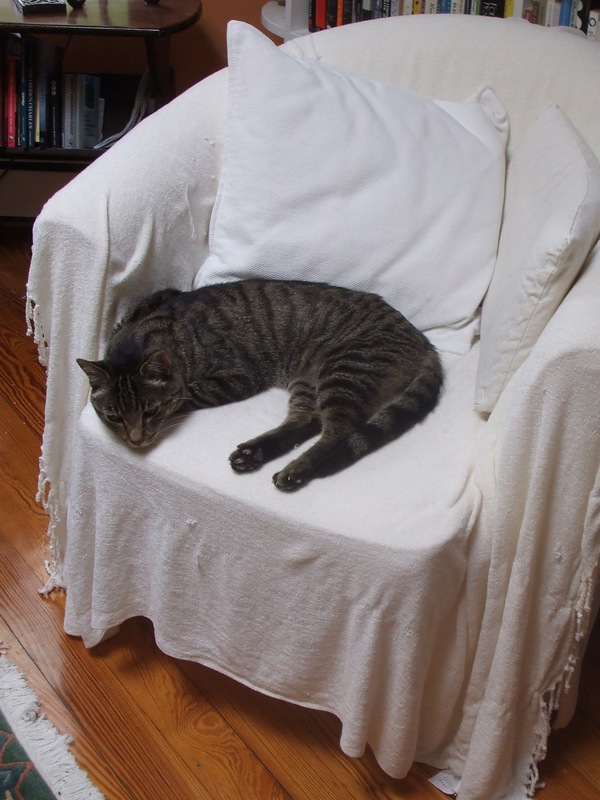 how lovely to have you drop in on the chair…..
Not to paint a picture of my sister-in-law as a crazy cat lady, BUT when her beloved cats, Max and Cagney, died she had them cremated. She kept their ashes in boxes on a bookshelf. When she herself was dying, her one request about her funeral was that the cats’ ashes be buried with her. When I tentatively broached the subject with the funeral director, he assured me that it would be absolutely no problem to tuck the ashes in the casket with Mary Jane. Apparently, some mourners make much stranger requests. My mama’s cat was her companion for 21 years. She loved that cat and we even caught her calling him Son from time to time. He was part of the family, giving unconditional love and comfort. Our “St. Francis” friends are our best teachers of learning to “let go and let God” as my mom used to say ~ turtles notwithstanding ~ We have one of those too and I am concerned her continuing care will be in part of my will. Our little friends may not be able stay with us on our long life journey, but their stories will. I grew up hearing the stories of my dad’s dog (even one ghost story about him!) and we have funny and tender stories about the many pets that have shared time with us. I think the saddest thing is when stories about those who have passed (human and not) are not told anymore. Maybe a wee book about TB is in order and then TB’s story can be passed on for many years and he will be a wonderful presence for a very long time, even for grandchildren and great grandchildren. Please tell us that all of you were okay in Cambridge and not reporting on the marathon in Boston proper? J was working the 22 mile marker is fine. we are safe and shaken. i can’t believe J was at 22. he is so sweet, texted me to make sure we were okay. i had NO idea he was on the course. it’s so surreal and sad here. the birds were singing at 4-something, and before my first flutter of eyelid i knew deep down: this was not just another morning. there were people, likely not even asleep yet, who would never ever see another morning as they’ve seen up till now……the people who have forever lost something dear — a limb, a loved one — and are shattered to the core…. Our beloved 12 year old, (would be 13 in May,) yellow lab Chloe went to the Rainbow bridge at the end of February. It was so difficult. We are grieving still ever day. There is such a presence missing from our home. And, the hardest part was trying to explain to 9 year old little guy why the dog he’d always known could no longer be with us. Saying goodbye to her was so difficult. But she went peacefully because that was what we owed to our sweet gentle girl. I hope your beloved TB cat holds on,and I wish you all peace. dear jean, bless you. and, most of all i am so sorry for all of you, and for your little guy especially…..how in the world can they make sense of it? especially the children who’ve never known their particular home or family without that furry (or hard-shelled) someone? and therein, perhaps, is one of the last best gifts our beloved animal friends give us, give our children. a through-and-through knowledge of what it means to love, and, heartbreakingly, what it means when that love must be reshaped, because the animal we love is no longer here, purring, barking, rubbing up against our shins, our laps, our shoulders.